I spoke about this design before, but I found the Maison's reinterpretation of this pattern in the dip dye variance tremendously appealing, particularly when tied. The Ex-Libris, featuring two different hues of the same colour, strikes me as utterly sophisticated and a pure joy to wear. 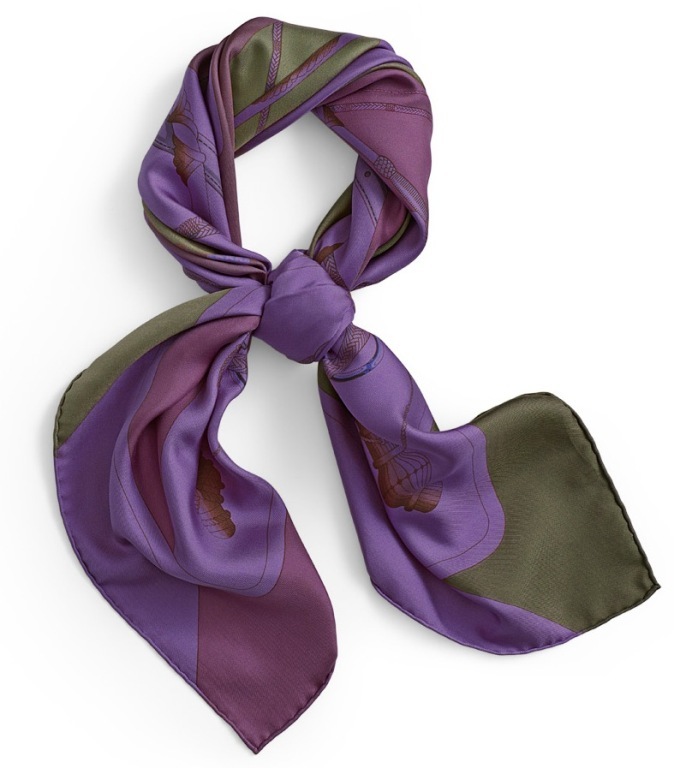 Its velvet-like look is an equally appealing characteristic that infuses the scarf with understated elegance. And to quote a beloved friend of mine, this design is awesome and also awful (as in the original definition, "full of awe" - that's the word originally chosen to describe Christopher Wren's St Paul's cathedral). I'm seizing this opportunity to say that I shall return with my articles in three weeks from today. Keep well until then and I look forward to featuring more scarves after mid-March. 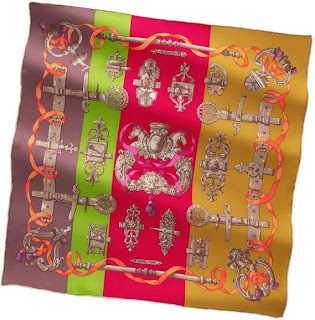 In the spirit of savouring the harmony of contrasting beauties the artisans' creative genius produces (this is equally valid when generalized to most aspects of our lives), I will shift my attention in this post to another kind of Hermes silk scarves. Today's post zooms in on the "Clic Clac" design, originally launched in 1980 and reissued in 1997 and 2004 (as well as in cashmere in 2008) prior to this season's dip dye variation. Afterall, an aesthete is a person without a precise identity in today's world, so I must be defined by my choices in the objects I feature. 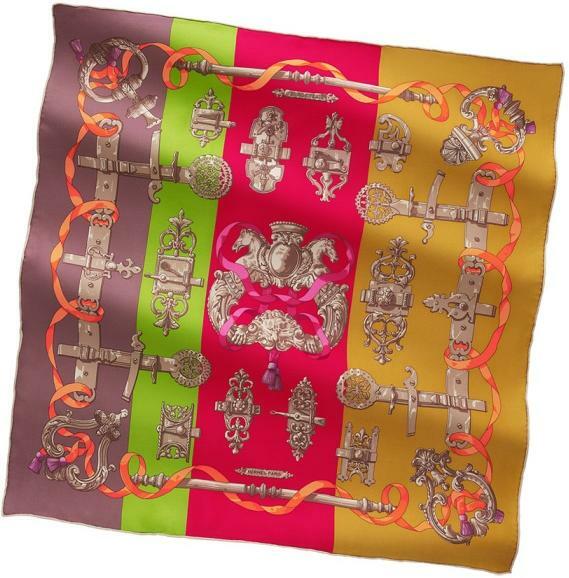 The design proper has not captivated me as many others have before, in part because the juxtaposition of equestrian devices and of a puzzle-like pattern doesn't speak to me, yet the dip dye finish renders it truly remarkable - hence my choice of featuring it. 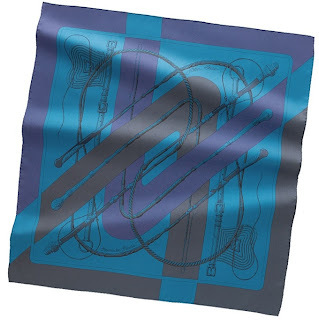 What caught my attention, however, are the symmetry of the pattern (I'll come back to this in a bit) and the whips, as the predominant motif of the scarf design. I instantly thought of the whip as a strong symbol of the taming exercise - a reflection of the man's desire to make nature work for him, or rather his attempt to domesticate the world. The topic of taming the savage has been explored countless times, particularly in the context of the objectives behind the taming. But what exactly constitutes the savage? Perhaps a concept of a melange of nature and culture (as the embodiment the animal and human being). More poignantly, it is also a an undefined territory as a reflection of a state of mind or even a moral attitude. Adam and Eve were expelled from the garden of Eden into the savage space - the place where humanity is supposed to seek - and achieve - redemption. We perceive that space as a danger, but also as a state of the soul that facilitates our undestanding of the world. Is this the reason why we feel a certain fascination towards the wildness - due to its dual effect of danger and attractiveness? When we want to explore the savage, nowehere is the search more fruitful than the investigation of the other side of the mirror (this is where the symmetry in the pattern resonated with me). This is one of the main reasons why the theatre and the cinema are equally appealing to me, as venues where the mosaique of the human character is fruitfully explored. This design did not impress me when the scarf was displayed, for it combines whips with certain geometric patterns that provide a puzzle-like picture overall without a strong connetion to the ambiant world. Yet the scarf ties so beautifully, and the dip dye treatment gives it such a soft, velvet-like appearance, I instantly recognized it as a personal favourite. My interest in traveling and in discovering new places has been rekindled recently when I read an article on one of the most prized museums in Europe, the Museo di Capodimonte in Naples (Italy). The old Bourbon palace is a hidden gem for art admirers thanks to the many masterpieces of the Farnese Collection on display – paintings of tremendous high artistry that reveal so much about the variety and vagaries of the human character (included in the collection is Parmigianino’s beloved “Antea”, an arresting portrait of a beautiful young woman whose image has been used in Italy on everything from fridge magnets to tea towels and Christmas ornaments. The woman’s identity continues to be, like Leonardo da Vinci’s Mona Lisa’s, somewhat of a mystery, while her beauty is truly haunting). The painting in particular made me think of the fascinating people that inspired such higher creation, people who – like us – held beliefs, followed customs and marked their existence with precious objects to protect them against evil spirits. Neapolitans are famously superstitious people – but then again, who isn't? I smile as I remember following very strict patterns when getting ready for the day ("right foot first" not only for when stepping outside or entering a new place, but also when putting on socks and shoes). Do such habits dissipate since we become aware of becoming more mature? Very unlikely – having lucky cuff links and ties, sweaters and jeans, glasses and even songs is case in point (not to mention that just the other day I caught myself reading my horoscope). 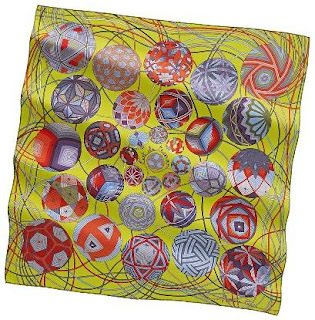 It is therefore in this spirit of lucky charms that Hermes has created “L’art du Temari” (“Temari art”), inspired by the Japanese tradition of offering these fabric balls, beautifully weaved in unique patterns of endless possibilities, as juggling equipment, lucky charms, gifts for births or weddings, for a New Year or a birthday. From humble beginnings as simple toy balls for children's play, Temari create a magnetic effect on lucky recipients and gift-givers alike. Many lose sight of the superstition involving the amulets themselves: they must be found or received as a gift, and never purchased on one’s own. Such traditions were held the world over, and have been as old as the 32,000-year old Lion Man discovered in Germany’s Hohleinstein Stadel grotto. As a spectacular decorating focal point, the puzzle of the design is mesmerizing. The equally fascinating aspect is that stitches can go in any direction because of the random wrapped thread surface of the ball: they are not limited to the traditional “up-and-down” or “side-to-side” motions as with traditional stitchery. 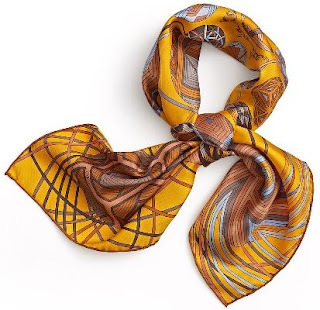 Of particular interest is the intriguing pattern carried through the scarf’s surface, particularly when the scarf is tied: it appears as if some loose threads have been left undone, an as open invite to the viewer to let his/her imagination explore the endless ways that the patterns can be made. 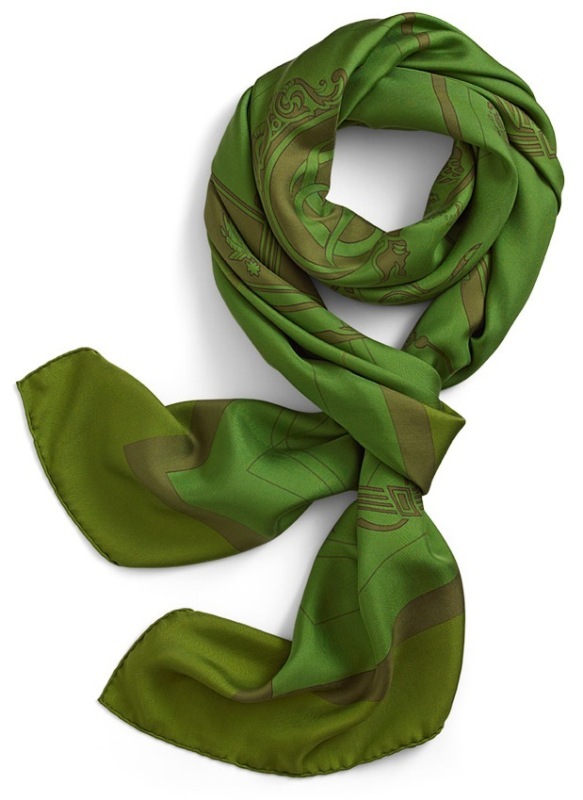 The colour combinations are pretty young, allowing the scarf to match the spirit of both younger and young-at-heart persons, due to the very playful nature of the pattern. In the spirit of having fun with the scarf, I encourage you to consider knots you haven’t previously sported. Let the play begin! 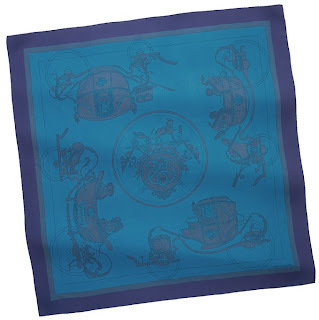 Last week I was talking about the nostalgia of times past, and this scarf brings to life the romanticized world of craftsmanship as we would experience it today predominantly in History books. 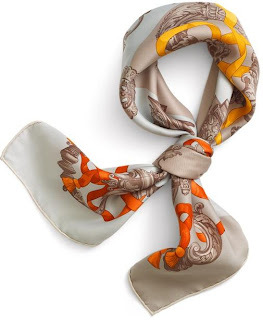 The year 2011 has been dedicated by Hermes to the artisans - the passionate visionaries who invest their time in intellectual or manual tasks, finely sculpting in effect the time in effect creating something with their time. So I couldn't think of a better ode to the creative act performed with passion, pleasure and delight than "Ferronnerie" ("ironwork"). The magic of this design stems from the beauty of the precious creations that ennobled one's life in discreet yet impactful ways; its charm stems from allowing us to realize that nowadays, the need to satisfy an increasingly large market has led to mass-production, resulting in ubiquitous yet uninspiring, mundane objects. Repetitive work, exceedingly uncreative, means degradation - not only of human activity but also of time's significance. Time is better wasted than enslaved and left to shrivel with each day's repetitions. Real work involves the mind and the entire body, leaving behind wrought iron hinges born of inspiration, contributing to culture and bearing witness to the passion that went into their creation. And how glorious these finely sculpted creations are, and how precious was the time spent creating them ! That's likely because every artist is the parent of what he/she does, not only metaphorically but also viscerally. This scarf is a successful reissue from 1970 in the smaller format (70cm). The colour combinations in this pattern infuse a great deal of life and joy into the design - sentiments echoed by the presence of ribbons swirling around the edges. Those same colour combinations also instill the vintage air into them, rendering them all the more desirable, despite the more traditional pattern.